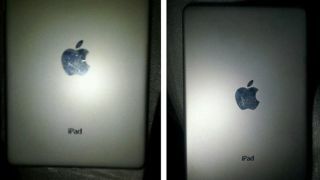 Pictures of a metal shell claiming to be the long-rumoured Apple iPad Mini have surfaced on a Chinese microblogging site. The rather suspect-looking casing, pictured above, appeared on the Sina Weibo blog and has been picked up by a few Apple sites since. We've been hearing rumours left, right and centre in recent days, weeks and months, claiming Apple will launch a 7.85-inch iteration of its world-beating tablet later this year. On Friday, it emerged in the Samsung vs Apple trial that Steve Jobs was "very receptive" to the idea. Taking a closer look at the pictures, you'll see that this purported casing has no hole for a camera lens, which makes us both sceptical and curious at the same time. Would the iPad Mini ditch the largely-unused, pretty turgid rear camera from the iPad? There's a good chance that these pictures are fake, but we remain hopeful that Apple will unleash a smaller iPad, perhaps as soon as the log-awaited iPhone 5 launch expected within the next couple of months.